Twenty-nine Tuvalu government employees successfully completed a 10 day training workshop in the use of Geographical Information Systems (GIS) conducted by technical officers from SOPAC from August 4 to the 17th in Funafuti. 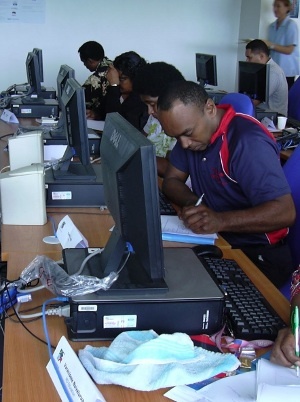 SOPAC provides assistance to 19 island countries and territories in the Pacific region through applied geoscience and technology which includes GIS training. GIS is a relatively new computer-based decision making tool that stores and displays information in an image such as a picture or a map format. “This allows policy or decision makers to better understand technical data and contribute to providing improved management solutions,” said SOPAC Director, Russell Howorth. 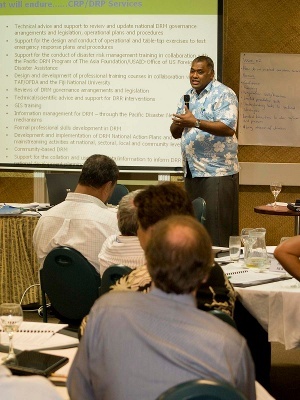 The SOPAC-organized Pacific Disaster Net user-training was held recently for the staff of the Fiji National Disaster Management Office as well as other selected Government employees. 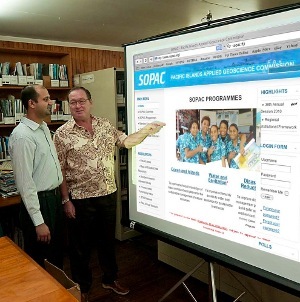 SOPAC provides assistance to 21 island countries in the Pacific region through applied geoscience and technology. The Pacific Disaster Net is a website that provides Disaster Risk Management partners in the Pacific, in-country information that addresses disaster management issues as well as assisting in development decision making. The partners include government agencies, regional bodies, non-government organizations and international agencies. 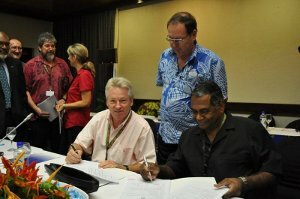 The European Union (EU) and the Secretariat of the Pacific Community (SPC) have today signed a Contribution Agreement worth €4.4 million for a project titled 'Deep Sea Minerals in the Pacific Islands Region: a Legal and Fiscal Framework for Sustainable Resource Management'. This project is funded under the 10th European Development Fund and aims to further the effective management and use of deep-sea mineral resources of the Pacific. 'The Ocean and its mineral resources is a most valuable asset for the Pacific. The aim of the project we sign today is to support the people of this region to make efficient and sustainable use of this great asset by fostering better governance and use of marine non-living resources of the Pacific,' said Christian Leffler, Deputy Director­-General of the European Commission's Directorate General for Development at the official signing ceremony in Port Vila. Mining Minister John Pundari announced on Tuesday that he would sign and award the licence today. It (mining licence) is a permit from the Government to allow Nautilus to start mining as soon as all related issues and matters are completed. The ML is a sign that the Government agrees for Nautilus to complete all preparations to start mining. Staff of the Oceans and Islands Programme of SOPAC, the Pacific Islands Applied Geoscience Commission, is engaged in working with technical personnel from the Government of Kiribati in order to update the Kiribati maritime boundaries database. This work is part of the SOPAC Maritime Boundaries Project, and follows similar survey work in Fiji and Papua New Guinea in 2009. Mr Andrick Lal, SOPAC Senior Project Surveyor, has just returned, having spent two weeks on the atolls of the North Gilbert Group, Butaritari and Little Makin, where he has provided training to develop expertise in the use of the latest technology in Global Positioning Systems (GPS) in order to establish baseline data essential for computing Kiribati’s Exclusive Economic Zone (EEZ). In Port Vila, at the Plenary Session of the 41st Pacific Island Leaders Meeting, Wednesday 4th August, the Director of SOPAC, Dr Russell Howorth and the Director General of SPC, Dr Jimmie Rodgers, signed a Letter of Agreement to transfer and integrate the core work programme of SOPAC into SPC as a new Applied Geoscience and Technology Division to commence operations on 1st January 2011. 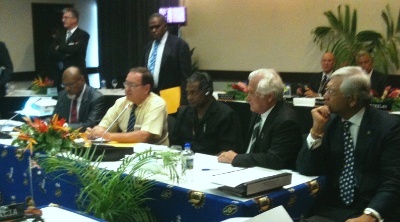 Witnessing the signing on behalf to the SOPAC Governing Council was the current chair Vanuatu represented by the Prime Minister of Vanuatu, Honourable Edward Natapei. The SPC Conference was represented by the current chair Tonga, represented by the Prime Minister of Tonga, Honourable Feleti Sevele.